Availability of power is one of the most important parameters for social and economical development of any region – it is appalling to know that almost one fifth of world population does not have any access to electricity. Skipper has executed many rural electrification projects globally using Skipper products. Under the aegies of RGGVY, ‘Rural Electrification’ has gained a new dimension for the BPL population in the rural areas of the country, so that power is ensured to the poorest of poors. We are the partners in process of grid connection to the remotest rural areas through supply of GI structures. Complete Rural Electrification Packages on Turnkey Basis of Transmission, Distribution & Connections to end users under RGGVY Scheme & REC. The company has gained specialization in rendering the best Rural Electrification Services across the country. Our team members undertake Rural Electrification in accreditation with the competent bodies. They make use of the best materials and advanced technology to ensure reliable Rural Electrification. 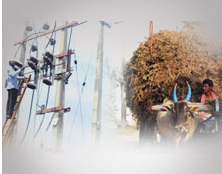 The Rural Electrification Services can be availed from us at the most competitive charges. Contributing to Nation building - "Bringing light into people's lives" Completed electrification more than 12, 742 villages all across India; currently we are in the process of electrifying more than 9, 502 villages across the country, which are at various stage of completion. Efficient name in the industry involved in offering the optimum quality of Remote Rural Electrification. Being the well-distinguished companies in the market, we are into offering Solar Rural Electrification Service. Technical assistance for identification, planning, implementation and monitoring of Village Energy Security Program and capacity building and outreach to villager for attaining the overall energy security in the villages. We offer Rural electrification which is the process of bringing electrical power to rural and remote areas. Electricity is used not only for lighting and household purposes, but it also allows for mechanization of many farming operations, such as threshing, milking, and hoisting grain for storage. In areas facing labor shortages, this allows for greater productivity at reduced cost.